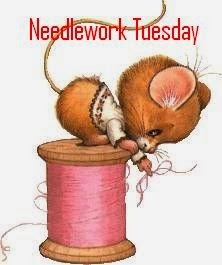 Love your needlework today. The headband is so colorful. Your idea of a quilt with the cross stitch sound awesome, can't wait to it put together. Have a great day!! I have just begun another eyelash yarn scarf for a grt niece. But I really need to knot that other sock! Too bad about the hat, but the headband is really nice. Love the colours! I'm afraid I don't have any good ideas for your carousel animals. They're pretty cool, though, and might look really nice incorporated into a quilt. Don't like the 9mm, eh? Try the 20mm. ;) Big needles aren't really that bad, IMO. If nothing else, it makes the knitting go faster, especially with scarves, which tend to take forever.